Finally we made first go for gogogo project, first public announcement of gogogo project is given at barcamp. We tells barcampers about 4 Ws of gogogo project, which are What ? Why ? Who ? When ? What is gogogo project ? Gogogo project is a open source web 2.0 transit trip planner, it is aimed to tell you how to go from point A to B by taking which public transits. It is sth. like Google transit, Yahoo travel, and Public Transport Enquiry Service (PTES) Hong Kong. 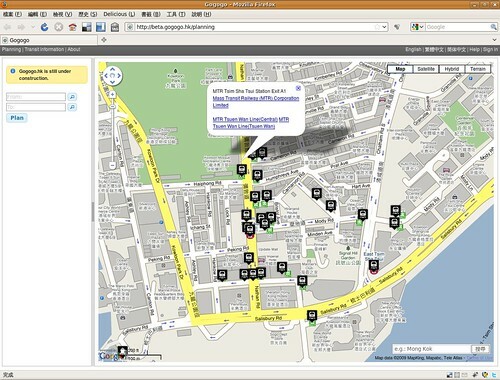 Gogogo project is based on Google Maps and Google App Engine with Django plus GAE patch. Besides a planner, it is a collaborative transit data management system as well. Transit data is maintained by the user community. Our project is aimed to develop a successful open source, community maintained, collaborative project in Hong Kong. Why and when did we start gogogo project ? Pilot version of PTES was launched by Transport Department on 28th April with all major media’s coverage (TVs, Radios, Newspapers). It causes HK citizens try it out on first day. With few thousand concurrency access to PTES, difficulties on PTES access and operations are discussed on twitter, plurk, blogs and discussion forums in Hong Kong. Discussion and callup to folk a open source project was started on 2nd day of PTES launch. And it is rarely to attract 10 open source developers and contributors, to show their interests to project and attend first project meetup on 6th May. I made a little video showcase on the night before barcamp, it describes the operation and some strange on PTES. The video is uploaded to youtube. Beta version is first disclosed at barcamp. The beta system provides MTR data only at this moment, we started to look for beta testers to try it out, any feedbacks to google group for our discussion are welcome. And we will offically introduce and discuss gogogo project again at Software Freedom Day 2009 Hong Kong on Saturday, let’s register it! Reference (Chinese): Gogogo 香港 Barcamp.